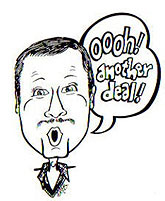 To go to Jim Guild's Famous Brands website, click on the drawing above or here. Click on the ad below for information about the Franklin Street Gallery. a local chapter of "Women Helping Women." Its Vision: To be the leading advocate for working women. Its Mission: Building Powerful Women, Professionally, Personally, Politically through advocacy, education, and information. SFLW meets the third Monday of the month. The Watkins Glen Area Chamber of Commerce maintains a timely blog regarding ongoing activities and themes in our region. HECTOR, March 7, 2019 -- Chateau LaFayette Reneau wines were recently awarded seven Gold medals at the Jerry D. Mead’s New World International Wine Competition, which took place in Ontario, California on February 24 and 25. In addition to a Gold medal, their 2017 Late Harvest Riesling received Best of Varietal and Best of Class honors. Other Gold medal-winning wines include their 2017 Barrel Fermented Chardonnay, 2017 Non-Oaked Chardonnay, 2017 Proprietor’s Chardonnay, Seyval Chardonnay, 2017 Semi-Dry Riesling, and 2018 Pinot Noir Rose. "We are thrilled with the results of this year’s competition for our 2017 vintage whites and 2018 Pinot Noir Rose,” said Winemaker Tim Miller. “We are proud to produce consistent, award-winning wines, and to be recognized once again by the New World International Wine Competition." The competition was established in 1991 by wine columnist, publisher, and consultant Jerry D. Mead, along with Bill Anthony and Eileen Tillery. The competition is open to wines produced anywhere in the world and open to all varietals. The wines are judged by price category to determine an overall best of variety in a “double-blind” format, meaning the judges do not know the identity of the wines they taste, nor do they have a list of entered wines prior to judging. For more information, visit https://www.nwiwc.com/. WATKINS GLEN, Feb. 21, 2019 -- The Seneca Lake Wine Trail will host Pasta and Wine Weekend March 22-24, 2019. This self-guided tour will take participants to 25 wineries along Seneca Lake. Each stop will feature a wine of their choice paired with a pasta-themed dish. "This is a great opportunity," said the Seneca Lake Winery Association in a press release, "to taste your way along the Trail while collecting unique, new recipes to try." Sample recipes include tortellini minestrone, pasta with pancetta, soba noodle salad, horseradish and smoked bacon pasta, fresh sage pesto alfredo with shredded paprika chicken, penne chicken Florentine, and cavatappi with butter squash and sage brown cream sauce. These dishes will be served with carefully selected wines, to showcase both the wine and the food. Tickets are $40 per person for tickets that include wine tasting. The Association encourages the use of designated drivers and offer tickets for them at $30 each. All tickets are on sale now on the Seneca Lake Wine Trail website: www.senecalakewine.com. Questions? Call the Seneca Lake Wine Trail Office at 607-535-8080. Founded in 1986, the Seneca Lake Winery Association, known publicly as the Seneca Lake Wine Trail, is a nonprofit organization, dedicated to promoting its member wineries; to developing a spirit of cooperation between members of the association; to developing an outstanding wine producing and tourism area; to stimulating interest in wine in general and the wines of Seneca Lake, specifically; and to gaining recognition of the Seneca Lake Winery Association as an independent leader in the grape growing, wine, and tourism initiatives. HECTOR, Feb. 15, 2019 -- Chateau LaFayette Reneau’s 2017 Dry Riesling was named the winner of the Riesling Challenge at the recent International Eastern Wine Competition held in Sonoma County, California. In addition, their 2017 Dry and 2017 Semi-Dry Rieslings received Double Gold and Best of Class awards. The International Eastern Wine Competition (IEWC), launched in 1975, is one of the oldest and longest running wine competitions in the nation. In 2019, there were 68 East Coast wineries competing with 378 wines, 31 of which received Best of Class awards. Chateau LaFayette was awarded two of only three Best of Class honors given to Finger Lakes wines and won the Eastern Riesling Challenge. WATKINS GLEN, Feb. 15, 2019 -- The first “Friday on Franklin” of 2019 is scheduled for March 1. The Watkins Glen Area Chamber of Commerce is inviting area residents and visitors to the Finger Lakes to beat the winter blues and enjoy shopping and a series of food and wine/beer pairings up and down Franklin Street in downtown Watkins Glen. The Chamber says attendees should begin at The Chamber offices (214 N. Franklin Street), where they can purchase their souvenir tasting glass, wrist band, and a map of all participating locations. It costs $10 to participate, and those who visit every stop will be entered into a drawing for a chance to win a prize. Attendees must be 21 or older to participate. The event will feature live music by The Sweats from 6-8 p.m. in the courtyard between the GRAFT Wine + Cider Bar and Glen Mountain Market. In the event of inclement weather, they will perform inside the Chamber’s Visitor’s Center. Wine tastings from Hector Wine Co.
WATKINS GLEN, Feb. 15, 2019 -- The Business and Education Committee of the Watkins Glen Area Chamber of Commerce has announced the guidelines for its 2019 scholarship competition. Any graduating senior (class of 2019) who is a resident of Schuyler County OR enrolled at Bradford, Odessa-Montour, or Watkins Glen Central School Districts is eligible to apply for this $1,000 scholarship. To apply, students must complete an application and submit a response to one of the three topics selected by the committee by April 30. Applicants may submit their response in one of three formats: a 1,000-2,000 word essay; a 3-5 minute video; a slideshow (Prezi or Powerpoint only) of at least 12 slides. 1. What are some things Schuyler County can do to attract young adults and recent college graduates to move to and settle in the area? 2. Identify an opportunity to improve the quality of life for Schuyler County residents. Make recommendations for how that can be accomplished. 3. What do you think is the single greatest problem facing society today? Why? WATKINS GLEN, Oct. 4, 2018 -- The Executive Committee of the Seneca Lake Wine Trail has announced that Brittany Gibson has been selected to lead the organization as Executive Director. A native of Dundee, NY, and a graduate of Ithaca College, Gibson has years of experience in both the wine and tourism industries. She was Advertising Director and Wine Club Manager at Fulkerson’s Winery for 10 years before serving as Tourism and Marketing Manager at the Watkins Glen Area Chamber of Commerce. Says Gibson: "I couldn't be more honored and excited to be selected as the Executive Director of the Seneca Lake Wine Trail. The organization has enjoyed much success already under great leadership and an enthusiastic, creative membership. I look forward to continuing that trend and I'm eager to get to work!" Gibson will start with the wine trail the last week of November. The Seneca Lake Wine Trail, founded in 1986, is an association of 34 member wineries located around Seneca Lake. WATKINS GLEN, June 1 -- The Watkins Glen Area Chamber of Commerce will join in celebrating the one-year anniversary of the Atlas Brick Oven Pizzeria in Watkins Glen on Friday, June 15 at 5 p.m.
Atlas Pizzeria’s original location in Corning served as inspiration for opening their second location in Watkins Glen in 2017. The celebration will be led by Chamber of Commerce Board President Paul Thomas, County Administrator Tim O’Hearn, and Watkins Glen Village Mayor Sam Schimizzi. In addition to the short program on Friday evening, there will be in-house specials and a happy hour that will last all day Friday and through the weekend, including live music by PA Line on Friday from 8-10 p.m. The anniversary celebration is free to attend and open to the public. Atlas Brick Oven Pizzeria is located at 304 N. Franklin Street in Watkins Glen. WATKINS GLEN, April 26, 2018 -- Chamber Connections Luncheons are a new benefit that the Chamber is offering to both potential and current members in 2018! These luncheons are relatively short and informal, but offer various opportunities. Location: Watkins Glen Area Chamber of Commerce Conference Room, 214 N. Franklin St., Watkins Glen. "Potential members," says the Chamber, "can learn about the benefits of Chamber membership, meet potential and current members and hear directly from them about their experience, as well as network with potential business partners. "Current members can learn more about the benefits of Chamber membership, to ensure that they are leveraging all of the benefits that are available to them and also meet fellow members to explore potential partnerships and business connections. Plus, this is a wonderful chance to interact with Chamber staff and keep them informed of your business developments, needs, and more." These luncheons are held monthly. Says the Chamber: "We encourage you to attend as many as you are able to! Each luncheon will offer different faces and different businesses in the mix. Be sure to bring a friend or a colleague to make the most out of the terrific networking opportunity!" WATKINS GLEN, April 26, 2018 - The Watkins Glen Area Chamber of Commerce is partnering with the Schuyler County Sheriff’s Department for a special education forum entitled FAIR Training (Fundamentals of Alcohol Recognition). The forum is open to the public and taught by Schuyler County Sheriff Bill Yessman and Undersheriff Breck Spaulding. The training features a power point presentation, lecture, and question-and-answer period. A guide book will be provided by E.C. Cooper Insurance. Location: Montour Moose Lodge, 2096 State Route 14, Montour Falls. The forum will provide training to those businesses in the community that serve alcohol. Most insurance companies require a seminar of this caliber. A certificate will be provided to participants upon successful completion of this presentation. Please RSVP your intentions to attend the FAIR Training to Chamber Events Manager Anna Rainous via email: anna@watkinsglenchamber.com or call (607) 535-4300. WATKINS GLEN, April 21, 2018 -- Watkins Glen High School and the Watkins Glen Area Chamber of Commerce have come together to promote the Job and College Fair being held at the high school on May 17. This, says the Chamber in a press release, "is a great opportunity for area employers and college admissions officers to meet local high school students." Advance registration is required by May 11. There is no fee for vendors to participate. For booth availability and reservations, contact Events Manager Anna Rainous at 607-535-4300 or email anna@watkinsglenchamber.com. WATKINS GLEN, April 15, 2018 -- The Watkins Glen Area Chamber of Commerce's Tourism Taskforce will present a TALES (Tourism and Leisure Exchange Summit) Customer Service and Hospitality Training on Tuesday, May 22 at the Watkins Glen Harbor Hotel. The event -- whose theme is "Your town is their adventure!" -- will run from 8:30 a.m. to 4:15 p.m.
What is it: This day of seminars will focus on the keys of providing great customer service, outstanding hospitality, and building customer relationships. Happy, satisfied customers spend more money, make more return visits, and tell their friends about their experience with businesses they love. Attendees will leave with tools they need to provide a stellar experience to all guests and thereby increase their business's bottom line. Who should attend: Frontline staff and managers from restaurants, retail shops, tasting rooms, salons, lodging facilities, museums, galleries, and beyond! This isn't just limited to tourism-based businesses. Anyone who interacts with the public on a daily basis should find this training valuable -- taking away new and improved skills, fresh ways of thinking, and real-world knowledge that can be implemented right away. How much does it cost? $75 per person for Chamber members, $100 for non-Chamber members. For information including seminar topics and access to the registration form, visit: www.watkinsglenchamber.com/tales. If you have any questions, call 607-535-4300 or email brittany@watkinsglenchamber.com. WATKINS GLEN, April 9, 2018 -- The Watkins Glen Area Chamber of Commerce is welcoming 66 new members to the organization. New members will be recognized during the 2018 New Member Breakfast on May 4 at Seneca Harbor Station in Watkins Glen. Altay Old Home Days Corp. The New Member Breakfast is an opportunity for the Chamber staff and current members to welcome new members and network with colleagues. A brief program will be presented by Rebekah Carroll, Chamber President and CEO. The program will include an overview of Chamber programs, new member benefits, and other opportunities available through the Chamber. All new members should be prepared to give a brief overview of their business. The event is sponsored by Chemung Canal Trust Company and hosted by the Membership Committee of the Watkins Glen Area Chamber of Commerce. New members (up to two representatives per business) are invited to attend at no charge. Veteran members may attend for $20 per person. Advance registration is required. Contact Meredith Williams at the Chamber at (607) 535-4300 or meredith@watkinsglenchamber.com. WATKINS GLEN, April 6, 2018 -- The Watkins Glen Area Chamber of Commerce will host a two-part seminar titled “Becoming a Business Owner 101” presented by Alternatives Federal Credit Union Business Cents on May 14 and 21 from 8:30 a.m. to 4:30 p.m. on both days at the Watkins Glen Area Chamber of Commerce, 214 N. Franklin Street, Watkins Glen. Becoming a Business Owner 101 is presented by the Alternatives Federal Credit Union Business Cents. The course will cover typical requirements and challenges of starting and operating a business, ranging from product and service development to business planning and financing. Additional topics discussed are business structure, regulatory and legal issues and lifestyle impacts. Each participant will complete a personal skills assessment and is strongly encouraged to sign up for follow-up free one-on-one consultations with our Business Consultants to help develop an action plan specific to his or her own business development. Who is the class best suited for? "If you are considering starting a business and need to understand a full range of challenges and opportunities you will be facing, this class is for you," says Alternatives in a press release. "We will spend a lot of time providing an overview of the most common issues contributing to success or failure. The class is structured to allow participants to identify their strengths, as well as weak areas where they will need to find support. Upon completion, you should feel equipped to make a determination to move ahead with your dream, or perhaps come to a realization that becoming a business owner may not be for you." The class will involve lectures, group activities, and lots of discussion and interaction. You are exploring multiple business ideas. You are not comfortable sharing and working in groups. You are a business owner with a few specific questions pertaining only to your current situation. You cannot attend for the entire duration of the course. "If any of these apply to you, you may gain a larger benefit from directly signing up for a free one-on-one consultation," Alternatives says. This can be done by clicking here. The class has limited enrollment and is kept small to ensure quality training and interactions. "Therefore, we only grant refunds in emergency situations," Alternatives says. The registration is $150 and includes lunch on both days. You can register here: https://www.alternatives.org/community-programs/business-cents/register-for-a-class.html. WATKINS GLEN, Feb. 19, 2018 -- The Watkins Glen Aea Chamber of Commerce is planning one in a series of Chamber Connections Luncheons from 12 noon to 2 p.m. Monday, March 5 in the Chamber Conference Room, 214 N. Franklin St. Lunch is provided. Connection Luncheons are a benefit that the Chamber is offering to both potential and current members. They are, a Chamber spoeksperson said, "relatively short and informal, but they offer powerful opportunities." 1. Learn about the benefits of Chamber membership. "Make sure you are taking advantage of these benefits and maximizing your investment." 2. Meet potential and current members. "These are potential business connections and customers." 3. Interact with Chamber staff and "keep them informed of your business developments, needs, and more." 4. Network, network, network. This luncheon "is the most unique and fun way to network! Be prepared to share with attendees for five minutes about your business and to make connections immediately." Participation is free and membership is not required to attend! Advance registrations are requested, though walk-ins are also welcome. RSVP by Friday, March 2 to Membership Services Manager Meredith Williams at 607-535-4300 or CLICK HERE to email your RSVP. "We encourage you to bring a friend or colleague," the Chamber adds. "The more, the merrier!" WATKINS GLEN, Feb. 5, 2018 -- As it has for many years, the Business and Education Committee of the Watkins Glen Area Chamber of Commerce is offering a $1,000 scholarship to any graduating senior who is a resident of Schuyler County or attends Bradford, Odessa-Montour, or Watkins Glen Central School Districts. 1. If you were to open a business in Schuyler County, what would it be? Why? Where would it be located? How would you cover the expenses of the business? 2. Who has been the most influential person in your life and why? 3. What are your thoughts on the evolution of the cell phone and/or social media? Applicants may use one of three options to answer the topic questions: a 500-1500 word essay, a 3-to-5-minute video, and/or a slideshow (using Prezi or PowerPoint) of at least 12 slides. Completed applications and accompanying responses must be submitted by March 30 to the Watkins Glen Area Chamber of Commerce, 214 North Franklin Street, Watkins Glen, NY 14891. For additional information, contact Rebekah Carroll at the Chamber at (607) 535-4300 or email: rebekah@watkinsglenchamber.com. PENN YAN, Dec. 20, 2016 -- With the New Year, Heather Davidson’s term as Finger Lakes Tourism Alliance Board Chair will end along with the Vice-Chair term on FLTA’s Executive Committee. Coleen Fabrizi of Corning’s Gaffer District will become the new Chair effective at the January Board Meeting on January 16, 2017. Alongside Fabrizi will be John Socha representing Yates County and the Showboat Motel taking over as vice-chair. Sarah Wiles and Gene Pierce will retain their positions as Secretary and Treasurer, respectively. Heather Davidson will remain on the Executive Committee as the Past Chair to round out the Executive Committee. The Board of Directors currently consists of 18 voting representatives, one representative from each of the 14 counties that make up the Finger Lakes and four At Large representatives. For a full list of FLTA Board Members, visit fingerlakes.org/about-the-region/about-us. The only member of the FLTA Board of Directors whose term is ending is Bonnie Hays of Historic Palmyra. The Nominating Committee is still in search of an appropriate representative from Wayne County to replace Hays. Although FLTA Executive Committee and board members are selected by the Nominating Committee, any partner can participate in the FLTA Marketing Committee that sets the direction of the Finger Lakes Tourism Alliance marketing efforts. If an organization wants to become a partner business, it can call the FLTA offices at 315-536-7488 or email the Director of Sales, Marianne Rosica-Brand, at MarienneR@FingerLakes.org. Founded in 1919, the Finger Lakes Tourism Alliance is recognized as one of the first destination-marketing organizations in the United States. FLTA is an association of private-sector attractions, tourism-related businesses and partnering county tourism offices working together to enhance and promote visitor businesses for the 9,000 square-mile Finger Lakes region of New York State. HECTOR, Dec. 1, 2016 -- Chateau LaFayette Reneau won a Jefferson Cup for its 2015 Semi-Dry Riesling at the recent 17th Annual Jefferson Cup Invitational Wine Competition, which took place in Kansas City, Missouri on November 17 and 18. With the addition of this recent award, winemaker Tim Miller celebrates a career total of five Jefferson Cups during his tenure at Chateau LaFayette Reneau. "We are honored to receive the Jefferson Cup for our 2015 Semi-Dry Riesling,” said Miller. “As a winemaker, I'm proud to produce consistent, award-winning wines, and proud to be recognized by the Jefferson Cup Invitational Wine Competition." The Jefferson Cup is an invite-only wine competition in which over 700 wines are pre-selected to be judged, culminating with the awarding of the prestigious Jefferson Cups. The estate-grown and bottled 2015 Semi-Dry Riesling received one of five Jefferson Cups awarded to a white vinifera wine in the competition, and was one of two Finger Lakes wines to earn a Jefferson Cup. Twenty-four in total were awarded to vinifera and non-vinifera red, white, and dessert wines across nine states. For more information, visit http://thejeffersoncup.com/. DUNDEE, Nov. 15, 2016 -- Glenora Wine Cellars has received an award for its 2015 Dry Riesling, which won both a Double Gold and "Best White Vinifera" honors at the 2016 American Wine Society (AWS) Commercial Wine Competition on November 2-3 in Costa Mesa, California. The AWS is the largest consumer-based wine education organization in the United States and its Commercial Wine Competition is one of the longest running wine competitions in the country. “I am pleased that our Dry Riesling received this very respectable recognition from the American Wine Society,” said Steve DiFrancesco, Winemaker at Glenora Wine Cellars. “The grapes for this wine were sourced from Glenora Farms, Dalrymple Farms, and Zugibe Vineyards on Seneca Lake, and Sunrise Hill Vineyard on Cayuga Lake, resulting in a blend that highlights the pleasing aromatic flavors that are making wines from the Finger Lakes famous." WATKINS GLEN, May 6 -- The Watkins Glen Area Chamber of Commerce celebrated travel and tourism in Schuyler County with the Schuyler Summit in honor of National Travel and Tourism Week on May 5, 2016. Location: Watkins Glen Area Chamber of Commerce, 214 N. Franklin Street, Watkins Glen, NY. National Travel and Tourism Week -- America's annual salute to travel and tourism -- was established by a congressional resolution in 1983. This week of events serves to champion the power of the travel and tourism industry. Travel and tourism professionals from across the nation work throughout the week to promote the contributions their travel markets and organizations make to the U.S. economy. The travel community marks the event in a number of ways, from staging local rallies and conducting media outreach to securing proclamations and resolutions from local governments. 8:30-9:30 a.m.: Best Practices for Trip Advisor presented by Brittany Gibbs, Tourism & Marketing Manager of the Watkins Glen Area Chamber of Commerce. 9:45-10:45 a.m.: Hiring Summer Staff presented by Peter Honsberger, Owner of The Great Escape & Everything Ice Cream. 11:00 a.m.-12:15 p.m.: Best Practices for Social Media presented by Brittany Gibbs, Tourism & Marketing Manager of the Watkins Glen Area Chamber of Commerce. 1:15-2:15 p.m.: Chamber Membership 101 for Tourism-Based Membership presented by President/CEO Rebekah LaMoreaux and Membership Services Manager Meredith Williams of the Watkins Glen Chamber of Commerce. Members and non-members alike were invited to attend one seminar, two seminars, or the entire day of programming. Members could attend the Schuyler Summit at no charge. There was a $5 fee per non-member per seminar, plus a $5 fee for lunch. The event culminated in a celebratory toast and cake at 2:30 p.m.
WATKINS GLEN, Dec. 21, 2015 -- The Watkins Glen Area Chamber of Commerce has named Mickey Coviello of Baltimore, Maryland the winner of its 2016 Travel Guide Cover Photo Contest. Coviello's photo features the iconic Triple Cascades in Watkins Glen State Park, one of the most visited state parks in New York. This image will grace the cover of 125,000 copies of the Official 2016 Watkins Glen and Schuyler County Travel Guide. The contest was launched on the Visit Watkins Glen and Schuyler County Facebook Page over the summer. Entries came from across the state and the country; overall, 24 photos were entered. After reaching over 22,000 people on Facebook, the three photos with the most “likes” moved onto the next round. The Tourism Committee of the Chamber then voted to select the cover. Watkins Glen Area Chamber of Commerce Tourism and Marketing Manager Brittany Gibbs, who oversees production of the travel guide, said she is thrilled with the cover selection. The Official 2016 Watkins Glen and Schuyler County Travel Guide will be available on March 31, 2016. There are two types of farms on the Trail -- “destination” and “non-destination” -- as some farms aren't equipped to have visitors. Currently, there are 11 farms on the Trail, with 6 being destination farms (Engelbert Farms in Nichols, Muranda Cheese Co. in Waterloo, Shtayburne Farm in Rock Stream, Side Hill Acres in Candor, Finger Lakes Dexter Creamery in King Ferry and Sunset View Creamery in Odessa). The non-destination farms participate in the Finger Lakes Cheese Festival, which was held at Sunset View Creamery in July. As Sunset View Creamery begins to grow and change, so do their events and ideas. 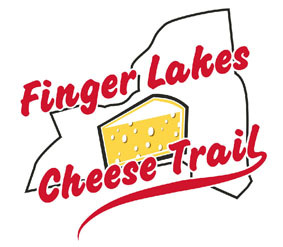 New on the docket this year are their “Toasted Cheese Sandwich Saturdays.” They will begin with a trial run on Saturday, June 6 (which also happens to be the first Open House of the season on the Finger Lakes Cheese Trail). Toasted cheese sandwiches will be made to order with a variety of different breads, cheeses and toppings. Gluten-free options will be available, too! For $5.00, you will receive a sandwich with your choice of cheese and breads, a bag of chips, and iced tea, lemonade or coffee. Carm doesn’t do anything solely for herself or her business. Fittingly, her Toasted Cheese Sandwich Saturdays will be a fund-raiser for the Food Bank, and will feature breads made by the Village Bakery in Montour Falls. Of the $5.00 cost of the sandwich, $2.00 will go directly to the Food Bank. Toasted Cheese Sandwich Saturdays will take place on June 6, June 13, July 11, August 8 and September 5. Simon Simek once said, “Working hard for something we don’t care about is called stress. Working hard for something we love is called passion.” While one can be certain that Carm’s job has plenty of stress, one can also be certain that she is driven by her passion for the region, her belief in the importance of the farming heritage, and her willingness to showcase these things to visitors from near and far. DUNDEE, Jan. 23, 2016 -- Glenora Wine Cellars has announced the hiring of Sean Gilchrist as Assistant Winemaker. Gilchrist is a graduate of Villanova University and currently working toward his Winemaking Certificate through the University of California, Davis. He most recently served as Harvest Assistant Winemaker at Hyde de Villaine in Napa, California and as an Intern with ROAR/August West wines in San Francisco, where he produced a small batch of Pinot Noir under a personal label. Prior to his work in California, Gilchrist traveled throughout the world working in hospitality and interning at wineries, including By Farr Winery in Geelong, Australia, Terroirs in London, and Domaine Dujac in Morey St. Denis, France. Glenora Wine Cellars, a pioneer in the Finger Lakes wine industry, has been producing award-winning wines for over 36 years. Owners Gene Pierce and Scott Welliver also own Knapp Winery & Vineyard Restaurant on Cayuga Lake. Knapp is a boutique winery with 60 acres of some of the oldest vineyards in the Finger Lakes Region, producing grapes for a variety of Knapp wines since 1982. In 2013 Pierce and Welliver purchased Chateau LaFayette Reneau on the east side of Seneca Lake. The 120-acre property contains 51 acres of meticulously maintained vinifera plantings. Pierce and Welliver maintain the three wineries as separate entities, each having its own distinct and unique identity. DUNDEE, Jan. 11, 2016 -- Glenora Wine Cellars has started its Ninth Annual Celebrity Guest Chef Pasta Nights at Veraisons Restaurant. The Thursday night series began on January 8, and continues until April 30. Every Thursday, local celebrities will don aprons to prepare and serve guests fresh dishes of pasta from the pasta buffet station. A portion of the proceeds will be donated to the charity of the Chef’s choice each evening. At the conclusion of the series, Glenora Wine Cellars matches the donation to the charity that brings in the most patrons. Glenora Wine Cellars has donated close to $12,000 to local charities through the program. On the horizon: 2016 marks the 10th anniversary of the series, which will bring a season-long celebration, with details to come throughout 2015. Guests receive a fresh garden salad, a bread basket at their table and unlimited trips to the pasta station. The Celebrity Chefs, with help from Veraisons staff, create fresh custom-made dishes of pasta from a selection of homemade sauces and ingredients, including an array of meats, fresh vegetables, garlic and herbs. Pasta Night at Veraisons is offered Thursday evenings from 5:00-8:30 p.m. Reservations are recommended by calling 1-800-243-5513. The cost is $17.95 per person, plus tax and gratuity. HECTOR, Jan. 11, 2016 -- Hazlitt 1852 Vineyards has announced the promotion of Jon Luckenbach as Sales Representative for Hazlitt's Cider Tree product. Luckenbach's focus as Sales Representative will be in the New York State market and will encompass handling distributor relations, sales, tastings and events. "Luckenbach's experience as Hazlitt's Red Cat Cellars Assistant Tasting Room Manager afforded him excellent product knowledge and made him an excellent fit for the new position," said General Manager Dan DeBell. Luckenbach joined the team at Hazlitt's Red Cat Cellars in July 2012 as a part-time Tasting Room Sales Associate and became full time by the end of the year. In August 2013, he was promoted to Assistant Tasting Room Manager. While in his Tasting Room Manager position, DeBell said, Luckenbach managed the tasting room staff, inventory, and tasting room sales, and demonstrated his enthusiasm for learning Hazlitt products. His commitment, skill set, and drive to sell, DeBell said, were recognized as an asset in the development of the Cider Tree sales team. "I am excited to have the opportunity to help drive the Cider Tree salesforce in New York State," said Luckenbach. "The cider market is booming and we have a hot product to introduce." The growth of the Cider Tree brand has been brisk since its introduction in spring 2014. The expansion of the sales team will support the continued growth of the brand in new markets such as Pennsylvania and Massachusetts in 2015. Cider Tree is a 6.6% ABV hard cider made with 100% New York State apples. All the packaging materials are produced in New York State. The product, gluten free, is produced with fresh pressed apples and champagne yeast. Cider Tree is a product of Hazlitt 1852 Vineyards and produced at Hazlitt's Red Cat Cellars. For more information visit: www.HazlittCiderTree.com. HECTOR, Aug. 13, 2015 -- A tour of Finger Lakes wineries and distilleries led Wednesday by Lieutenant Goernor Robert J. Duffy highlighted Governor Andrew Cuomo's annual Governor’s Cup program, culminating in the presentation of the 2014 Governor's Cup to Hector's Chateau Lafayette Reneau during a dinner at the Harbor Hotel in Watkins Glen. The Finger Lakes Wine and Craft Beverage Tour, organized to promote New York State’s beverage industry and boost tourism to the State’s growing number of wineries, breweries, distilleries and cideries in Upstate New York, included stops at Finger Lakes Distilling, Damiani Wine Cellars and Chateau Lafayette Reneau, and provided State and local leaders, wine industry professionals, restaurateurs and tourism officials a first-hand look at how New York spirits and wines are produced. At the Governor’s Cup Competition awards ceremony, which followed the Tour, Duffy presented the 2014 Governor’s Cup to Chateau Lafayette Reneau for its 2013 Semi-Dry Riesling. The Cup is a large silver chalice, recognizing the “Best of Show” or top prize from 863 entries in the annual New York Wine & Food Classic wine competition, organized by the New York Wine & Grape Foundation. In addition, Macari Vineyards & Winery from Long Island won the “Winery of the Year” award. This year's competition included 835 wines, 20 hard ciders and eight spirits from across the State. The awards were based on blind tastings by 22 expert judges -- four from California, 10 from New York, seven from other states and one from France. Judges included prominent wine writers, restaurateurs, retailers and wine educators. Judging panels determined the initial awards, with top-scoring wines evaluated by all 22 judges for the Best of Category and Governor's Cup awards. New York is now home to more than 600 wineries, breweries, distilleries and cideries. The State ranks third in the nation in wine and grape production, second in apple production, has the second most distilleries and is home to three of the 20 top-producing breweries in the United States. New York’s beer, wine, spirits and cider industry continues to have a tremendous impact on the State’s economy. Between manufacturing, agriculture, distribution and retail, in 2012 the industry had a combined economic impact of more than $27 billion and employs more than 85,000 people. (National Beer Wholesalers Association; New York Wine & Grape Foundation) According to a recent study commissioned by the New York Wine and Grape Foundation, the full economic impact of New York grapes, grape juice and wine in 2012 was $4.8 billion for New York State. Since 2011, the number of farm wineries has risen by nearly 50%, from 195 to 291 today. In addition, the number of farm wineries opening branch offices, authorized by legislation signed by Cuomo in 2011, has increased by 97%, from 29 to 57, and the number of wineries has also increased, from 52 in 2011 to 76 today, for a total 46% growth. WATKINS GLEN, Nov. 7, 2013 -- The Society of Automotive Historians has presented the International Motor Racing Research Center with its James J. Bradley Distinguished Service Award. The award honors the work of libraries and archives whose mission is to preserve motor vehicle resource materials. "We are so pleased to be honored with the SAH Bradley Award," Center President J.C. Argetsinger said. "This award, from our peers of archivists and historians, is a gratifying affirmation of the work we're doing at the Center." The award was presented at the SAH annual meeting and awards banquet Oct. 11 in Hershey, Pennsylvania. 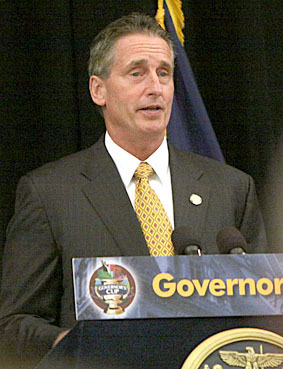 Michael Argetsinger, a member of the Center’s Governing Council, accepted the award. 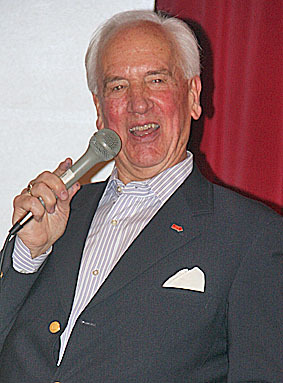 The award was established in memory of James J. Bradley, noted curator of the National Automotive History Collection at the Detroit Public Library. The award was first presented in 1982. The Society of Automotive Historians was founded in 1969 to encourage research, preservation, recording, compilation and publication of the historical facts concerning the development of the automobile and related items, from inception to the present throughout the world. It has a worldwide membership of 1,000 and has active chapters in the U.S. and the United Kingdom. To learn more about the SAH, visit its website at www.autohistory.org. The Racing Research Center is an archival library dedicated to the preservation of the history of motorsports, of all series and all venues, through its collections of books, periodicals, films, photographs, fine art and other materials. For more information about the Center’s work and its programs, visit www.racingarchives.org or call (607) 535-9044. The Center also is on Facebook at International Motor Racing Research Center. HECTOR, Oct. 16, 2013 -- Gene Pierce and Scott Welliver, owners of Glenora Wine Cellars (Dundee) and Knapp Winery & Vineyard Restaurant (Romulus), have recently completed the purchase of Chateau LaFayette Reneau in Hector from Richard and Betty Reno. Pierce and Welliver say they plan to maintain the three wineries as separate entities, continuing with each having its own distinct and unique identities. Visitors at Chateau LaFayette Reneau can expect the same great wines and the same standard of excellence in customer service, said Pierce. Pierce and Welliver plan to expand the Chateau LaFayette Reneau vineyard acreage, as well as the distribution of its wines. “The increased awareness of the Finger Lakes Region and its wines provide an ideal environment for the growth of Chateau LaFayette Reneau,” said Pierce. Chateau LaFayette Reneau was established in 1985. During the past 28 years its wines have received national and international recognition for superior quality in such events as The Jerry Mead New World International Wine Competition, Riesling DuMonde, and the Governor’s Cup. 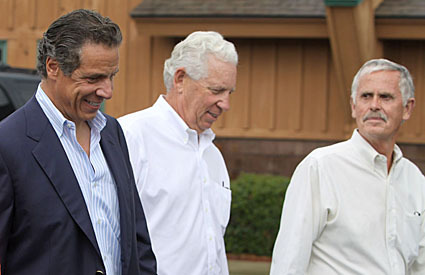 Photo in text: From left: Governor Andrew Cuomo, Scott Welliver and Gene Pierce during the governor's visit to Glenora on Aug. 13. 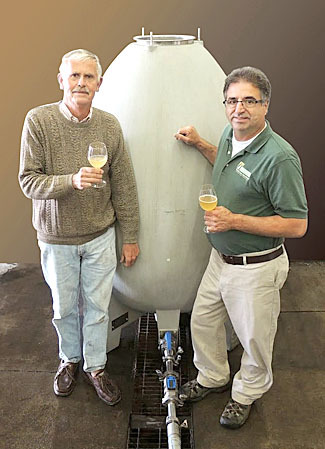 DUNDEE, Oct. 2, 2013 -- Glenora Wine Cellars recently purchased a concrete egg-shaped tank from Burgundy, France to use in its wine production. It will be used instead of the standard stainless steel tank or oak barrel. The egg shape was designed by Michel Chapoutier from the Rhone Valley of France. The egg shape, similar to the clay amphora wine jugs from the Roman Empire, eliminates dead corners and ensures a continuous flow of the fermenting wine. Glenora is the first winery in the Finger Lakes to use the concrete egg. Gene Pierce, co-owner of Glenora Wine Cellars, became intrigued by the concrete eggs when he first saw them on a trip to the Rhone Valley last spring. A benefit to using the egg, says Glenora in a press release, "is that there is a tiny amount of oxygen exchange, which will allow extended yeast contact without the danger of reduced, naturally occurring sulfur aromas. The size and insulating properties of the concrete design will eliminate the need for artificial temperature control during fermentation. The egg will allow similar richness and body in the wine as barrel fermentation without adding oak flavors or tannins." The egg holds 184 gallons, or about 77 cases. This limited release Pinot Blanc will be available for tasting and sales in early summer of 2014. Glenora Wine Cellars has been producing award-winning, high-quality wines for over 35 years. In 1977 it was the first winery to open on Seneca Lake. Today a 30-room inn (Inn at Glenora) and a gourmet restaurant (Veraisons) join the winery on a 40-acre estate. HECTOR, July 26, 2013 -- Hazlitt 1852 Vineyards, owned by Doug Hazlitt and Leigh Hazlitt Triner, and Atwater Estate Vineyards, owned by Ted Marks, were each presented with an Agricultural Environmental Management (AEM) "Farmers Partnering to Protect Our Environment" roadside sign Thursday recognizing their exemplary conservation of natural resources and commitment to environmental protection. The Schuyler County Soil and Water Conservation District presented the sign awards during the Schuyler County Farm Bureau summer picnic attended by over 200 people and held at Atwater Vineyards. Hazlitt 1852 Vineyards, located in the Town of Hector, has been an active farm in Schuyler County for over 160 years, with 140 acres of vineyards presently in production along both Seneca and Canandaigua Lakes. Dalrymple said that Hazlitt 1852 is known for its efforts to prevent erosion and enhance soil organic matter through the use of permanent sod, cover crops, mulch, and compost in vineyard row middles and through the protection of headlands. "The AEM program helped us install many of the best management practices that we use and we will continue to participate since the program promotes the environmental protection goals that keep our farm viable,” said Doug Hazlitt. In accepting their award, both Leigh and Doug said that John Santos, their vineyard manager, has spearheaded the environmental protection efforts in their vineyards and deserves most of the credit. Hazlitt and Triner also operate one of the largest wineries in New York State. Atwater Estate Vineyards is also located in the Town of Hector and has been in the family since 1999. It has 50 acres in grape production growing 16 different varieties. It also uses permanent sod and mulch in its row middles to prevent erosion and keeps headland areas vegetated. Katie Marks, Ted’s daughter, operates the successful winery on the farm and Chaz Coney is the vineyard manager. Also recognized were Bob Tamborelli and Mike Betts, who help manage the vineyards. The Schuyler County Farm Bureau and the Schuyler County Agriculture and Farmland Protection Board are co-sponsors of the awards with the Conservation District. AEM is a statewide program with over 10,000 farms voluntarily participating. To learn more about the AEM program in Schuyler County, visit www.schuylerswcd.com or call the Schuyler County Soil and Water Conservation District at 535-0878. BURDETT, June 13, 2013 -- Kathie Notarfonzo of Burdett was recently promoted to Assistant Regional Director of the Finger Lakes State Park Region. The Finger Lakes Region oversees 21 active facilities (12 with swimming, 11 with camping, and 12 with marina/boat launches), six gorges, and many miles of trails. Notarfonzo -- a 1985 graduate of Watkins Glen High School -- started her career in 1986 as a secretary at Finger Lakes Regional Headquarters in Trumansburg and has moved through various positions throughout her career, including Health and Safety Officer and facility manager of the Ithaca area parks. She is a graduate of RIT with an OSHA certification. Notarfonzo also manages Exercise Enterprise, a Watkins Glen health and fitness center. She is married with three sons. HECTOR, May 28, 2013 -- Red Newt Cellars Winery & Bistro is slated to host a dinner at 6:30 p.m. Saturday, June 1 to support the Debra Whiting Foundation and to celebrate Debra's vision and commitment to the wine, food, farms, families and community of the Finger Lakes. Debra Whiting (pictured at right) was, Red Newt points out, "a visionary chef in the Finger Lakes wine growing region. Her passion was not just the food as it appeared on the plate, but the food as it grew on local farms." During the 12 years that she led the culinary team at Red Newt Bistro, she was a leader in the development of farm to table relationships that blossomed with the burgeoning wine industry of the Finger Lakes. On June 1st, Holland is joining forces with Veraisons Restaurant at Glenora Wine Cellars Executive Chef Orlando Rodriquez to not only prepare the wine and food for the dinner, but also to pay tribute to Whiting, who died from injuries sustained in a motor vehicle accident on the New York Thruway on June 30, 2011. The evening will feature an announcement of the first agriculture grant to a local Finger Lakes farm, introduction of 2013 culinary scholarship applicants, and a silent auction. The cost to attend is a $100 donation to the Foundation. Tickets may be purchased at debrawhitingdinner.eventbrite.com. WATKINS GLEN, April 11, 2013 -- Atwater Estate Vineyards, a 13-year-old winery located in Burdett, plans to open a tasting room on Franklin Street in downtown Watkins Glen. The Tasting Room by Atwater, as the new business will be called, will be at 204 North Franklin Street, across from the new Nickels Bar B Que and next door to the Glen Mountain Market and Bakery. “Being within one block of the Harbor Hotel and the waterfront, the location is going to offer the tourists and residents an opportunity to taste local wines in the late afternoon and evenings,” said Marks. The Tasting Room by Atwater will be open from 12 noon until 8 p.m. most evenings, especially during the tourist season. Marks said that in addition, The Tasting Room by Atwater will carry artisan cheeses made by local creameries. The Atwater winery is located at 5055 Route 414, Burdett . It currently employs 10 workers on an 80-acre farm and produces 16 different wines from its vineyards. The winery was recently awarded several gold medals for Rieslings, and consistently receives high ratings for red wines . Assuming all licenses are approved by New York State and local agencies, The Tasting Room by Atwater hopes to open before Memorial Day weekend. Three full-time and four part-time positions will be created for the new venture. WATKINS GLEN, Oct. 31, 2012 -- The International Motor Racing Research Center at Watkins Glen has received a grant to fund the digitization of United States Grand Prix materials. The $7,000 grant from the South Central Regional Library Council in Ithaca will support the Center’s commitment to making materials in its collections more easily available to the public. Center President J.C. Argetsinger said the materials of which digital copies will be made include 20 years of race programs, some 200 photographs and some 200 pages of race results. Some of the materials are not now available to the public from any other source. The United States Grand Prix had a home at Watkins Glen for 20 years, from 1961 through 1980. The first Formula One Grand Prix race was run at the Glen on Oct. 8, 1961. Once digitized, the Grand Prix materials will be accessible through the Center’s website at www.racingarchives.org and through New York Heritage at www.nyheritage.org, a research portal for students, educators, historians, genealogists, and anyone else interested in learning more about the people, places and institutions of New York. The Racing Research Center is a non-profit 501(c)3 charitable organization founded in 1999 and located in Watkins Glen, also home of the Watkins Glen International race track. It is recognized as a world-class leader in the collection of materials representing the documentary heritage of amateur and professional motor racing worldwide. The New York Heritage website provides free access to more than 160 distinct digital collections, totaling hundreds of thousands of items. The collections in New York Heritage represent a broad range of historical, scholarly, and cultural materials held in libraries, museums, and archives throughout the state. Collection items include photographs, letters, diaries, directories, maps, newspapers, books and more. The Regional Bibliographic Data Bases and Interlibrary Resources Sharing Grant will be administered by the South Central Regional Library Council. The Library Council is one of nine Reference and Research Library Resources Councils in New York. As a multi-type library consortium, the Council serves 69 members across 10,000 square miles in the counties of Allegany, Broome, Cayuga, Chemung, Chenango, Cortland, Delaware, Otsego, Schuyler, Seneca, Steuben, Tioga, Tompkins, and Yates. The Beverage Testing Institute uses double blind tastings to judge the wines. The panels consist of screened and trained professionals who all have an extensive wine-related background. Glenora Wine Cellars has been producing award-winning wines for over 33 years. In 1977 it was the first winery to open on Seneca Lake. Today the property offers a 30-room inn (Inn at Glenora) and a gourmet restaurant (Veraisons) adjoining the winery on a 40-acre estate. WATKINS GLEN, July 3, 2012 -- Sahlen’s Packing Company, Inc. has announced a multi-year renewal of its partnership with Watkins Glen International as title sponsor of the Sahlen’s Six Hours of The Glen Grand-Am Road Racing Series event. Currently the longest consecutive title sponsorship at The Glen, this season marks the 10th year of this partnership. The latest annual race was run last weekend. Sahlen's Packing Company, a leading producer of meat products in Western New York, is known for its hot dogs, sausages, and deli meats. It was founded in 1869 in Buffalo. WATKINS GLEN, June 28, 2012 -- Renovation work has begun at the site of the future Watkins Glen Area Chamber of Commerce Visitor Center. The former home of the Seneca Lake General Store at 214 N. Franklin St. in Watkins Glen is now empty, with the first phase of the Center renovation process just beginning. The Chamber hired Hunt Engineers of Horseheads to design the layout of the new Chamber home right after plans for the Center were announced in December. General contractor. for the job is Kermit Cutter Construction, which is headquartered in Newfield. The need for a bigger and more modern facility has grown over the years. Last year, 17,813 tourists paid a visit to the current 1,700-square-foot Visitor Center – and with growing numbers, a small greeting center without a public restroom was deemed no longer sufficient. The new location is 5,100 square feet. It will include two public restrooms, a conference room, and five offices for Chamber staff. It will also feature special displays that are representative of the region, and which will be revealed at a ribbon cutting ceremony, expected in September..
Added Vicki Schamel, Chairwoman of the Chamber’s Board of Directors: "Being in the heart of the Finger Lakes, Watkins Glen is poised to be a very vibrant town for tourism and the economy." Construction is scheduled to be completed by the end of August. HECTOR, June 21, 2012 -- Hazlitt 1852 Vineyards has hired Daniel DeBell as General Manager. DeBell comes to Hazlitt 1852 Vineyards with 20 years of management experience. Through his career he spent time in key roles in business development, marketing, project management and production efficiency. "We are thrilled to have Dan join our senior management team and bolster our management expertise," said Leigh Triner, Co-CEO of Hazlitt. "Our company's rapid growth and acquisition of Hazlitt's Red Cat Cellars in Naples, NY necessitated we increase our organizational leadership. Dan is a perfect fit for us." "I am really excited about the growth potential of the business, the commitment of the people and the amazing products," said DeBell, adding: "I look forward to being a significant part of the future of Hazlitt 1852 Vineyards and Hazlitt Red Cat Cellars." 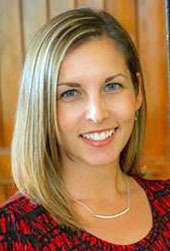 A native of Ithaca, DeBell earned a degree in Applied Economics, Business Management and Marketing from Cornell University. He currently lives in Trumansburg with his wife Michelle, four dogs, three cats and 32 horses. The Hazlitt family has been growing grapes on the eastern shore of Seneca Lake for over 150 years. Established in 1984, Hazlitt 1852 Vineyards continues the family tradition of award-winning viticulture and wine production. In 2010, Hazlitt's Red Cat Cellars was founded when the Hazlitt family purchased the 3 million gallon-plus Widmer Wine Cellars in Naples, New York from Constellation Brands. The family's wines include Riesling, Pinot Gris, Gewürztraminer and Cabernet Franc. Most notably, Hazlitt is famous for its Red Cat, White Cat and Cabin Fever -- some of the most popular and best-selling New York State wines available. For more information, visit: www.Hazlitt1852.com, www.redcatcellars.com or www.redcatwine.com.